The Bent Pyramid of Dahshur is located approximately 40 kilometers south of Cairo. 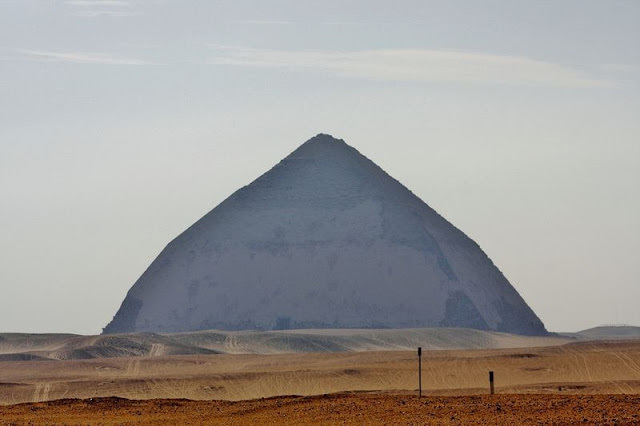 It is one of the unusual pyramids of ancient Egypt, but until 1996 it was relatively unknown outside archaeological circles because there was an army camp nearby and so the area was restricted. 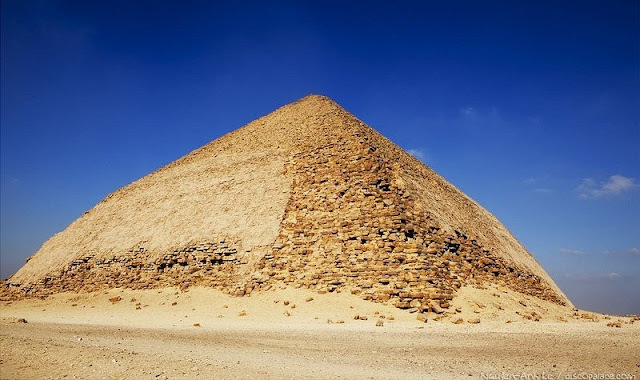 The Pyramid originally began with a very steep angle of 54 degrees but halfway through construction the builders realized that the angle was too steep. So the upper half was completed at a shallower angle of 43-degrees to prevent the structure from collapsing. This gives the Pyramid a “bent” appearance leading to its modern name. It is believed that the Bent Pyramid was the first Egyptian pyramid intended by its builders to be a "true" smooth-sided pyramid from the outset. Earlier pyramids were either stepped, or first built as stepped and later filled in to make a smooth outer casing. 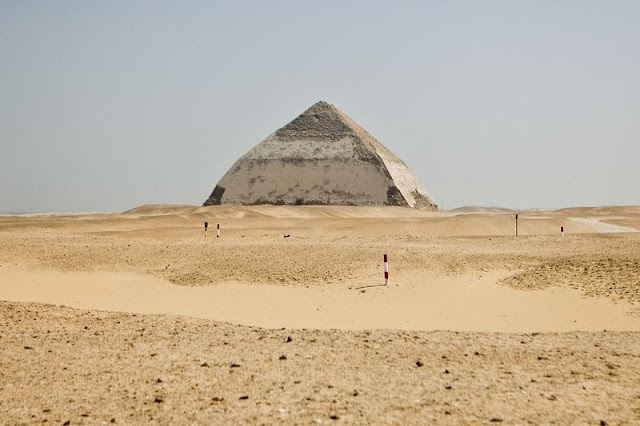 The Bent Pyramid also boasts of being the only pyramid to have its original polished limestone outer casing largely intact. Many Egyptian pyramids, including the Great Pyramid of Giza, originally had a smooth outer casing of highly polished white limestone that must have shone brilliantly under the desert sun. These were stripped away during later generations and carted off to build other structures around Egypt. 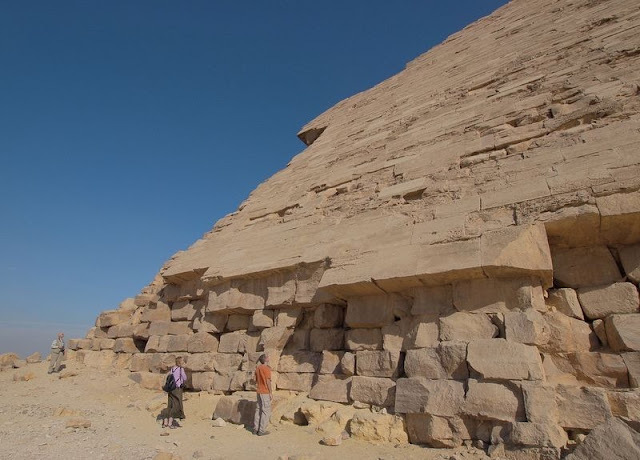 The blocks of stones we see on the pyramids today is the core structure. 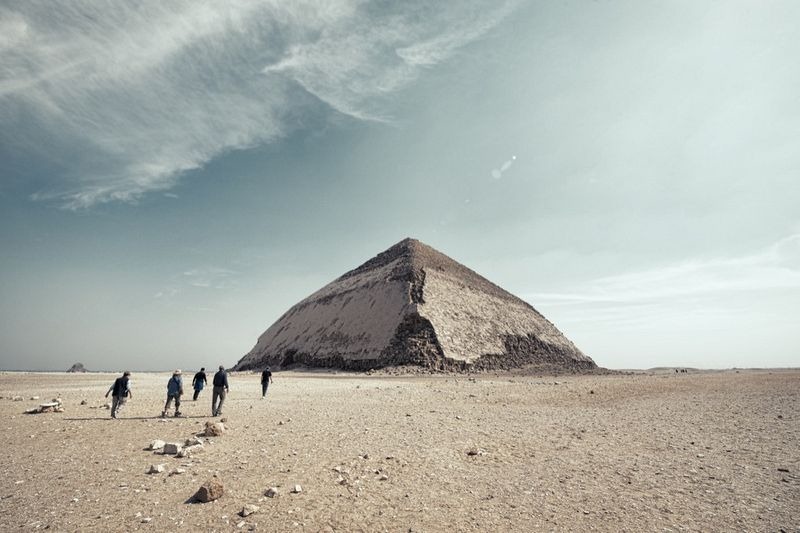 On the Bent Pyramid, the outer casing is still visible which serves to show how the ancient Egyptians intended their pyramids to look, although it has lost its shine and parts of it are crumbling away. The Pyramid was commissioned by Sneferu, who was the father of Khufu, who commissioned the Great Pyramid of Giza. Snefru’s first massive undertaking was the Pyramid at Meidum which was originally started by his father King Huni. However, Sneferu never completed the pyramid. It’s believed that the Meidum Pyramid had partially collapsed during construction and was therefore abandoned. Sneferu then relocated his capital to Dahshur where he began constructing his second pyramid, the Bent Pyramid. Sneferu’s third and his last pyramid stands approximately one kilometer to the north of the Bent Pyramid. It’s called the Red Pyramid or the North Pyramid and is the largest and the most successful of the three. Having learned from his past failures, Sneferu ordered the Red Pyramid to built at the same shallow 43 degree angle as the upper section of the Bent Pyramid, which gave the pyramid a noticeably squat appearance compared to other Egyptian pyramids of comparable scale. The Red Pyramid was the first successfully completed smooth-sided pyramid of Egypt, a design that was later adopted by many of his successors including his son Khufu, when he built the magnificent Great Pyramid of Giza.